(1) Bioinorganic chemistry in environmental science. (b) Cell-based sensors and fluorescent probes for metals, gasotransmitters, and small RNA. 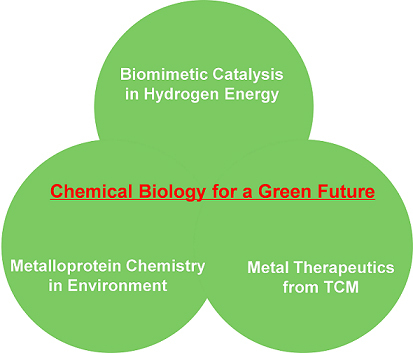 (2) Biomimetic catalysis in energy science. (3) Metal therapeutics inspired by Traditional Chinese Medicine (TCM). (b) Design and synthesis of metal-based compounds as anticancer agents.